This entry was posted on Friday, February 17th, 2012 at 5:00 am	and is filed under Reading. You can follow any responses to this entry through the RSS 2.0 feed. Both comments and pings are currently closed. 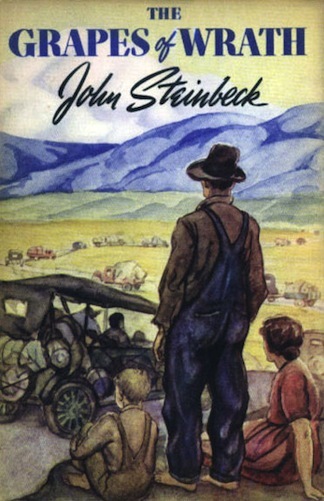 I have a vague recollection that I may have read Grapes of Wrath in high school. My kids did. But honestly, I can’t recall. As for those massive books that are sometimes hard to get into and then you’re “in it” and don’t ever want to leave – my tendencies went to the Russian classics. Anna Karenina, Crime and Punishment, Brothers Karamazov. These proud, worn books still sit on my shelves – a few in the original Russian (talk about taking a year to read!) – and I only wish I had the time and headspace to re-read some of our great classics. BLW – I know what you mean about struggling to get into these kinds of books and then wanting to stay forever. I felt the same way about East of Eden and Gone With the Wind. As for the Russian classics, they are on my To Do list. Last year I had intended to dedicate the year to reading classics and what with the pregnancy and all it never happened. I’m trying to take a more balanced approach to my reading this year – reading a mix of popular fiction, nonfiction, and classic novels. A Tale of Two Cities is first on the list. If I get through that one, Anna Karenina is next. My sister read it in college and loved it, so I’m really looking forward to it, but I’m intentionally waiting until SSP is sleeping through the night before I even attempt it. No matter how bad things get – ever – there is always someone with less, and we always have something left to give. — Yep. Best lesson ever.